Since this is the third and final book of the Delirium trilogy, I sort of feel like I can't write a proper summary of the story without giving too much away from the previous two books. But I doubt anyone is going to run out and read Requiem without having read Delirium and Pandemonium (at least I hope not!) so I guess I can give a little bit away. Starting right where Pandemonium left off, Lena is still living in the Wilds with the other Invalids when it is soon discovered that Regulators from the other side of the fence are infiltrating areas around the borders to try to vanquish the rebellion. Regulators have never breached into the Wilds before because they have never wanted to acknowledge the existence of the Invalids, but as the Resistance movement continues to grow stronger, both Regulators and Invalids can no longer deny what they know is true: Resistance will soon build to Revolution. In this last installment of the trilogy, Lauren Oliver has added a new element to her story-telling: a second narrator. In the first two books Lena was the sole narrator, but now Oliver has included the voice of Lena's former best friend Hana to the mix. This addition brings an interesting dichotomy to the narrative by hearing from someone who is "infected" with amor deliria nervosa and also someone who has been "cured." This dichotomy builds to a fever pitch by the climax and leaves the reader/listener feeling both angry and satisfied at the same time. And while I didn't love this book or the second book nearly as much as the first one, I felt the ending was both satisfying and disappointing at the same time. But I think that's what happens when you get emotionally invested in characters and a storyline; I don't know if any end will entirely satisfy you. 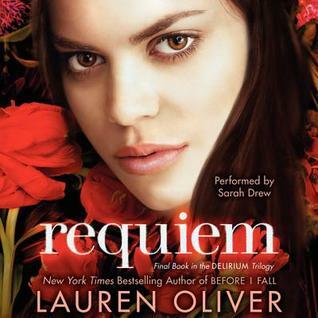 I know many people who have been waiting to read Requiem are wondering what will play out with the whole love triangle aspect that left us hanging in Pandemonium, and I have to say that I was pleased that Oliver chose not to spend a great deal of energy focusing on that element of the story. Instead, more time was spent focusing on the differing perspectives between Hana and Lena's voices, which I have to say quite pleased me since I think the love triangle trope is tired and way overdone. Sarah Drew returns as the audiobook narrator in this final installment and she is still the perfect fit to tell this story. When I reviewed the first book, I mentioned how the listener really gets a sense that Drew feels everything the characters are feeling in her performance. And yet, in this book, while her performance during dramatic moments felt real and heartfelt, those "in between" moments of the story had a tendency to feel overacted. So while I thought her performance during the moments of heightened emotion were spot on (especially the climax I was referring to above), it was the emotionally neutral moments that I felt needed to be toned down a bit. Still, that is a rather nit-picky criticism because Drew is one of my favorite female audiobook narrators. I hope to hear more from her in the future.